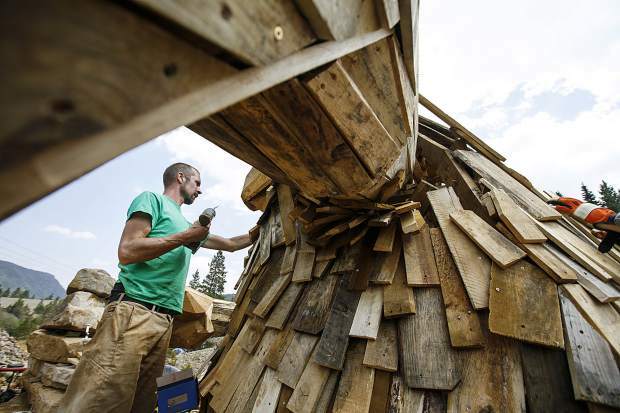 "Isak Heartstone", under construction by Danish artist Thomas Dambo, emerges along the Wellington Trail in part of Breckenridge International Festival of Arts on Tuesday, Aug. 7, in Breckenridge. Make your way to Stables Drive and park at the Wellington Bike Park. Walk uphill a few feet and turn left onto East Wellington Trail, towards the neighborhood and power lines. The troll sculpture is surrounded by giant rock piles. When you cross a rock footpath you’re getting close, but if you cross a wooden bridge you’ve gone a little too far. However, Thomas Dambo encourages people to get lost. Visit ThomasDambo.com for locations of his other work. 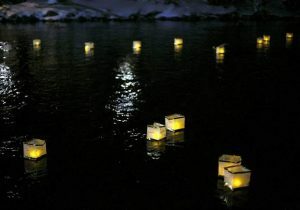 For the next nine days, Breckenridge will host a multitude of live artistic experiences and static installations. More than a dozen artists of varying mediums have arrived to showcase their work during the fourth season of the Breckenridge International Festival of Arts. 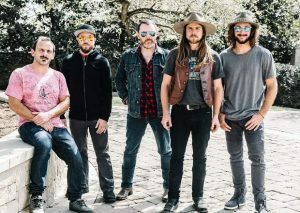 Live performances include the Breckenridge Music Festival Orchestra on Saturday, multi-instrumentalist Andrew Bird on Sunday and a jazz and skating collaboration featuring The Other Black and professional skaters such as Andy Macdonald on both days. Additionally, pop-up concerts by Trail Mix, Chirp!, an a cappella group featuring Denver-based Chimney Choir, and Tree-o, musicians perched on tree branches, will occur on the Illinois Creek Trail, Wellington Trail, Iowa Hill Trail and Moonstone Trail throughout the festival. The Riverwalk Center will screen a family-friendly movie night on Tuesday, where guests are invited to arrive via skateboard, scooter or bike. On Thursday, Manual Cinema will create a film called “Lula Del Ray” in real time using projectors, shadow puppets and a music ensemble at the Riverwalk Center. To close out the festival, Australian circus group Gravity & Other Myths will show off their acrobatic abilities at the center on Aug. 17-19. In between the days of performances guests can wander around the town and trails to view art by Thomas Dambo, Edina Tokodi, Michael Grab and Nicole Banowetz. Boulder-based Grab created freestanding rock sculptures along the Blue River downtown while Banowetz’s “Nature Will Not Miss Us” inflatable sculpture will take over the Old Masonic Hall. Also located in the hall is a fusion of landscape art and plant materials crafted by Hungarian artist Tokodi. Both Tokodi and Banowetz also have pieces out in the wilderness, inviting festivalgoers to interact with and understand the world around them. On the Illinois Creek Trail, Tokodi’s “Yeti” grass sculpture has a hole in place of the face and on the West Wellington Trail one can find Denver-based Banowetz’s inflatables inspired by the root systems of the natural world. Like Tokodi’s and Banowetz’s work, interested parties will have to go on an adventure to find Dambo’s wooden troll. 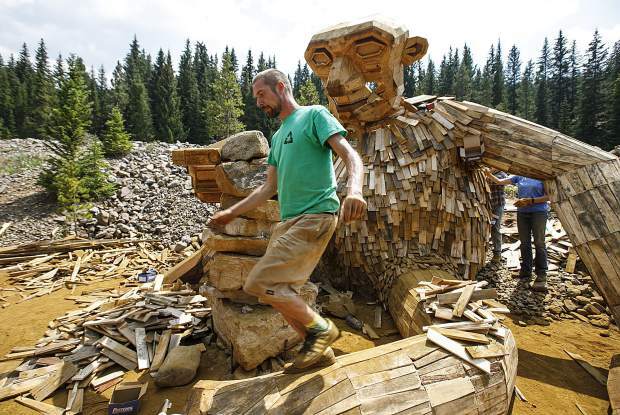 The roughly 15-foot-tall sculpture sits among a pile of rocks near French Creek along the East Wellington Trail. There, the troll stacks stones into a cairn in praise of the mountain landscape and invites others to create cairns nearby. Dambo grew up in Odense, Denmark, and has always loved crafting pieces from recycled material such as plastic and wood. 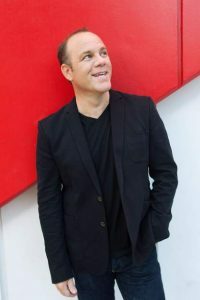 He originally studied to be a carpenter but sought a more creative outlet and attended the Kolding School of Design in 2005. He opened his own workshop in Copenhagen shortly thereafter to begin his international upcycled sculpture career. Approximately four years ago he started the series of trolls installed out in the wild. According to Dambo, every time he cut wood for a different project he would be left with remnants he didn’t know how to dispose of lying in a bucket at the end of his workbench. Inspired by Danish mythology, he decided to recycle his own trash instead of others’ and the fragments became the trolls. 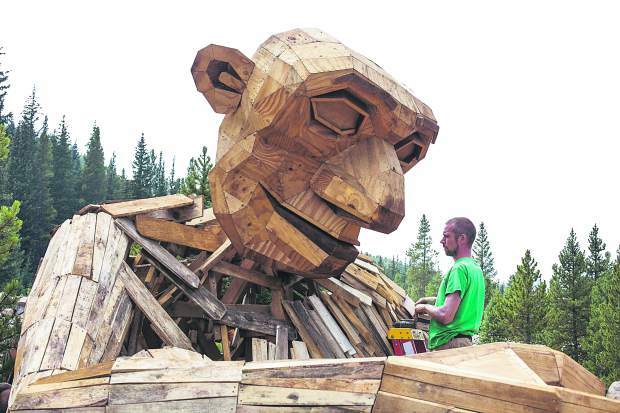 The Breckenridge troll is made out of scrap wood and pallets along with pine sourced from the trail. 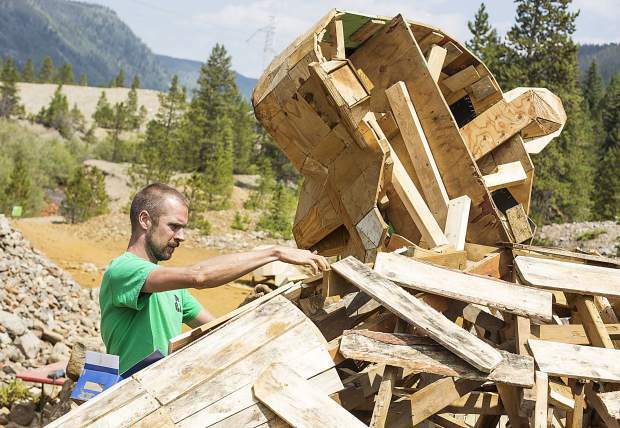 Rather than affix the wood together solo, Dambo has employees, friends from Denmark who made the trek and local volunteers assisting with constructing. 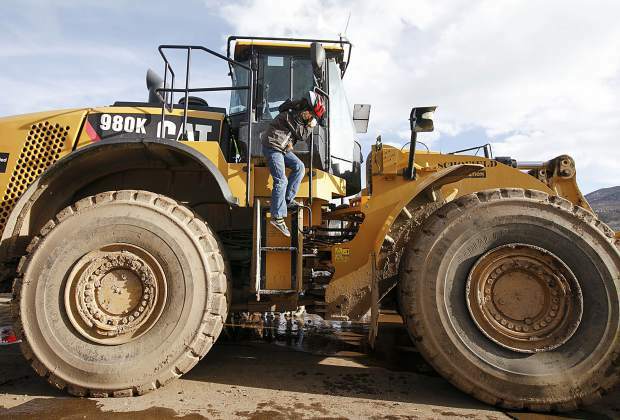 Aside from dealing with jetlag and altitude, the approximately 10-day construction went smoothly. When completed, Dambo named the troll “Isak Heartstone,” partly due to a heart-shaped stone that was given to the artist by local children from the Wellington neighborhood. Dambo always honors someone involved with the project by naming the troll after them. In San Juan, Puerto Rico, for example, the piece “Wilson’s Car” has a troll smashing a red sedan donated by a local named Wilson. That message of bettering the world is prevalent in Dambo’s work. He believes we are drowning in our own waste to the detriment of nature. As someone who handles trash on a daily basis while creating artwork, he hopes to motivate people to recycle more and change the negative connotations associated with something often foul smelling and filthy. In Dambo’s narrative of the series, trolls were the first inhabitants of the earth. They existed in peace for centuries until aliens, i.e. humans, landed on the planet. The trolls tried to teach them to live in harmony with nature but the humans instead acted selfishly, destroying the environment. The story of conservation fits into Summit County life and history as the Heartstone troll ponders why humans destroyed the mountains in search of gold. Breck Create commissioned Dambo and though he had a general concept in mind before reaching Breckenridge, he took elements from the surrounding nature into consideration to create something new and elevated. 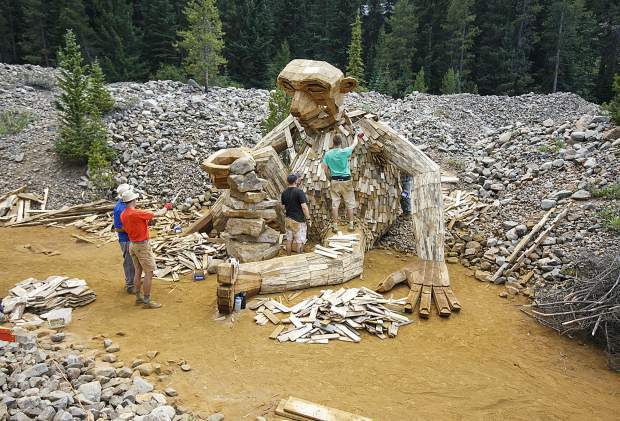 However, Dambo knows his wooden sculpture has to compete for attention with the nearby creek and mountains. He wants people to understand that it’s more about the journey than the destination and he sees the trolls as carrots on sticks, drawing the public away from more traveled areas. With multiple trails in the vicinity, Dambo wishes people will explore more once they arrive or perhaps stumble upon the troll by accident as they set upon unexplored areas. He says the surprise creates a unique experience and can’t be replicated in a trip to a museum with painting-lined hallways. 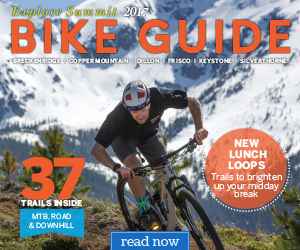 This is Dambo’s 39th troll and the first he has installed in the western United States. Before coming to Breckenridge, he made five in Korea and six in Chicago. Following the theme of conservation, the trolls in Chicago are now upset about the urbanization of the land. Instead of peacefully sitting in the landscape, they are posed eating people or trapping them under a cage using a golden gas can as bait. Other trolls are more playful in nature. For example, in the Danish town of Horsens he has “Troels” holding a swingset while “Laura and Julian” keep a slackline taught. 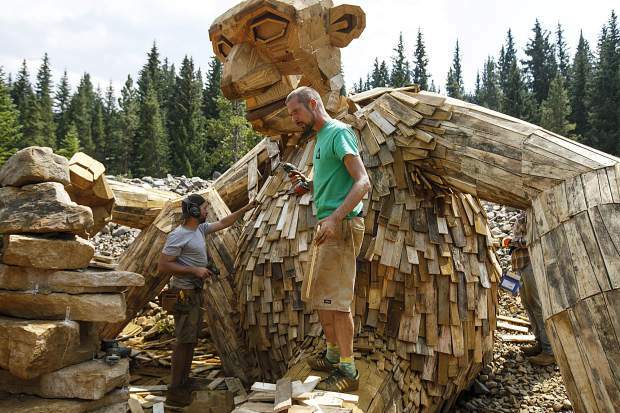 Next, Dambo will install another mountain-themed troll in Tennessee and he has already started constructing the head. Fictionally, Dambo’s trolls live for millennia, though an art piece in the wild likely won’t last as long. Yet that doesn’t bother him and Dambo in fact prefers it. 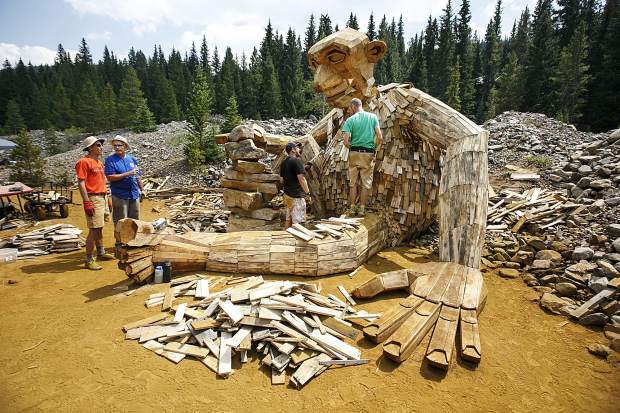 The troll is expected to remain in its habitat for a few years, provided it isn’t vandalized. Dambo is optimistic it won’t be. He says that at each new location residents tell him someone will destroy it in a couple of weeks, however, Dambo has yet to witness it.